Hello! I am very excited today because not only am I talking about my new bag, which I friggin' love btw, but I also plucked up the courage to record my first YouTube video! The main reason for the video is that is much easier, and much more fun, to actually show you what's in my bag than just try to write a blog post about it. Although I actually really enjoyed making the video I also found it really hard work. The light kept going, I obviously picked a really bad day to film but the forecast ahead of us isn't looking any better so I thought I might as well just get on with it, I had some trouble focussing so I ended up switching lenses and my memory card got full up halfway through recording! Anyway, I've put this video at the end of this post if you'd like to scroll down and watch now, or you can wait until the end! Right, back to actually point of this post - my new bag. As I explain in my video I decided it was time to invest in a proper grown up handbag after years of using tiny impractical bags that didn't hold anything, pretty backpacks that held everything but made it a pain to find anything, or just no bag at all. I wanted something practical, that would be my go-to bag always ready when I was heading out the door. 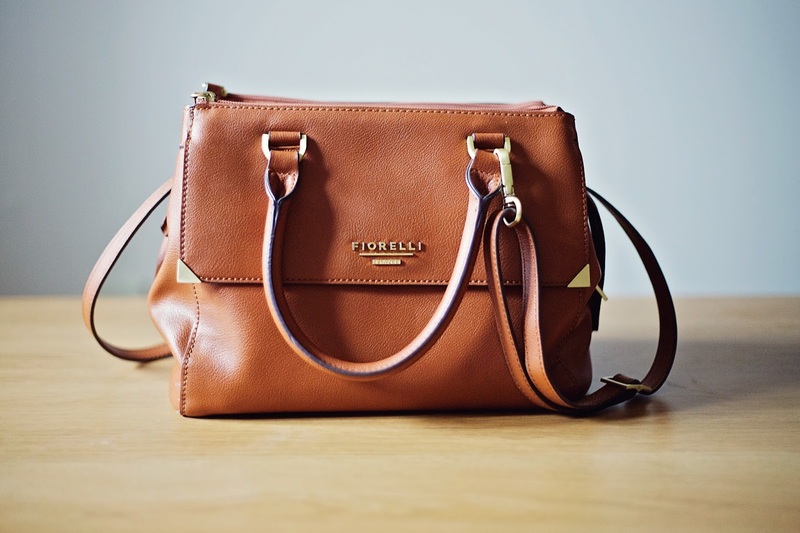 I fell in love with the Fiorelli 'Mia' grab bag in tan and have adored it more and more the longer I've had it in my possession. I ordered is from ASOS where it is currently £59.00 but I got it on sale for around £42.00 I think. The reason I love this bag is that it has so many options and pockets. I love the grab bag style of having both handles and a shoulder strap as it makes it really easy to pick up and also to sling it over my arm. 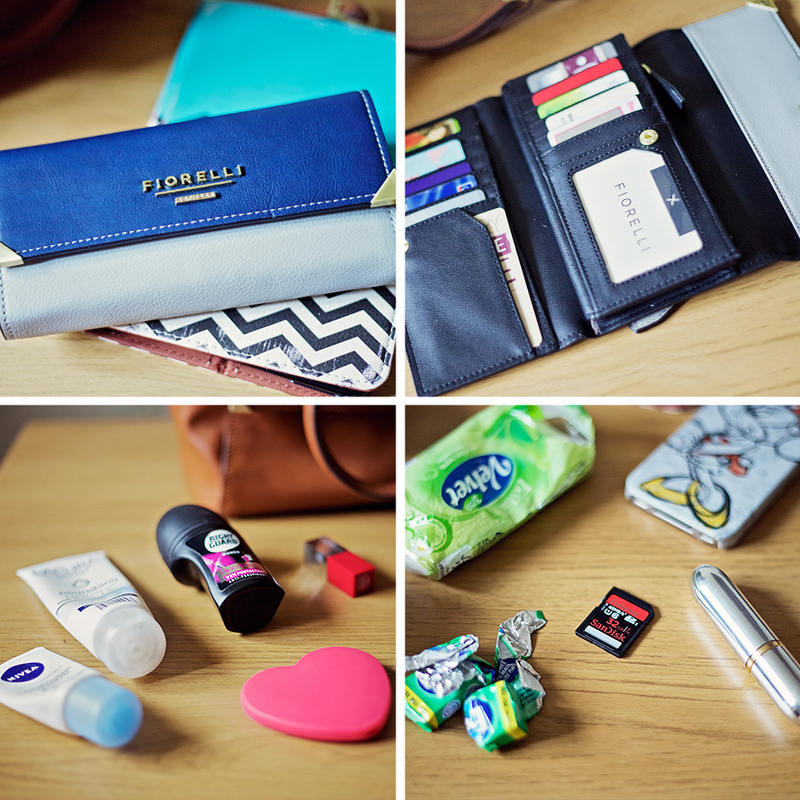 I love that the bag itself is split into three different sections, an organiser's dream! There's an additional flap pocket on the front and the middle section also had a zip pocket and two open pockets that are really handy for putting my phone in. It is just the right size to hold everything I need without being too big or too small. The leather-look fabric is beautiful and the fact that it is tan means that it should go with everything I own. Personally I think it is the Goldilocks porridge of bags. I don't think I could love a bag any more! I won't bore you by chatting about what I have in my bag as I babble on for long enough about all my bits and bobs in my video but for those of you that don't want to watch it I will quickly mention two things. My iPad Mini and my purse. As I already mentioned the bag is split into sections and I love that one of them is the perfect size for my iPad and I can easily chuck it in there and not worry about whether to take it with me or not, it is really no hassle at all. Secondly my purse is my new love. It should've been a Christmas present as there's no way I can justify £39.00 on a purse (!!) but as I spotted it on sale for only £23.40 Harry very kindly offered to get it for me (really it's a bribe as he wants to get Halo when it comes out!). I picked the navy and grey version of the Fiorelli 'Verity' purse instead of going for the matching tan one but I absolutely love it! More pockets than I could ever need but stylish, practical and in my favourite colours. There isn't much more a girl could want! Watch my video now if you've made it to the end of this post without watching it already and see my wonderfully awkward self babble on about how much I love my bag/purse and chat about how 'handy' (I used that word A LOT) everything that I have in it is! Let me know what you think in the comments and please let me know if you'd like more videos from me as I am not currently making my videos 'public' or allowing YouTube comments just yet as it is still a bit overwhelming!